FMB: KFC Coupons WILL Be Honored! My most sincere apologies. I have communicated with the restaurant and the Director of Operations. The coupons you have will, in fact, be honored. If there are any further problems, please instruct Band Members to ask for the Manager on Duty. I feel terrible for the misprint and frustration this must have caused your members. We will be working with our restaurant team to coach them to better handle such situations. Again, I very sincerely apologize for the confusion. 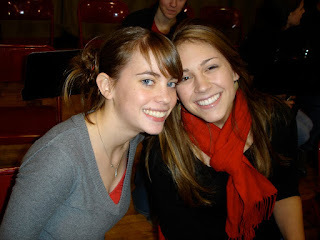 Alumni Pep Band - December 18th! 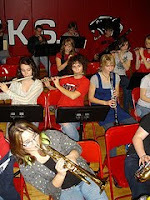 The seventh annual Fairbanks alumni pep band will be held on Friday, December 18. FHS band alumni from all bands and eras are welcome to come back to play on the stage and cheer the Panthers on to a victory! 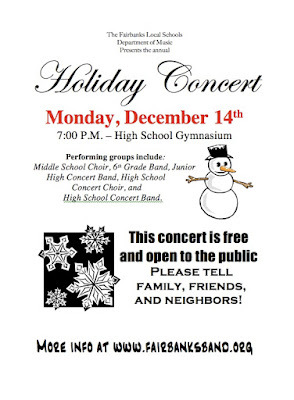 We'll warm up at 6pm in the band room and perform between games and during the boys' varsity game. I promise the set list will be easy, fun, and not too taxing on the chops...even if you haven't dusted off the chops in a year...or two...or ten. LouieX2, Tequila, Land of 1000, Can't turn you loose, Sloopy, On Broadway, et al. It'll be fun, I promise! Please RSVP to let me know if you're coming, and also let me know if you need an instrument. I'll do my best to get folders to you in advance if possible. I hope to see all of you on the 18th! Please help me spread the words to all your band friends. *Gentlemen are to wear dress pants or khakis, dress shoes, a dress shirt and tie. No jeans or tennis shoes are permitted. *Ladies may wear a skirt or pants outfit. If you choose to wear a skirt, it is to cover your knees when seated. Keep shoes sensible and avoid high heels unless you are a pro. Just as for the guys, no jeans or tennis shoes are permitted. *Gentlemen are to wear black dress pants, black socks, and black dress shoes. A tuxedo shirt will be provided for you at no cost, but this shirt must be returned at the end of the school year. *Rehearsal today 3-5pm in the band room. *You will have third quarter off to take a restroom break or get food from the concession stand. You are to be on the stage and ready to play at all other times. Boosters will occasionally have food and beverage for you during this time as well. *Only band members are allowed on the stage. Your non-band friends will have to sit in the student section. Sitting on the stage is a benefit of membership. We'll kick off our first fundraiser for the NYC trip this Thursday, December 3. Order sheets will be available, featuring Zap-A-Snack frozen french bread pizzas, as well as soft pretzels, cheesecake, and cookies. You can preview the brochure (sans prices) by clicking here. Sheets will be due with payment no later than Tuesday, December 15. Your profit margin will be 30% of your total sales. Delivery will be the week of January 11. Please make all checks payable to "Fairbanks Music Boosters." If you have customers who pay in cash, you must have a parent keep the cash and write a check for that amount, since the boosters do not accept cash at any time. I hope this is a successful fundraising effort, as these are quality products at reasonable prices. I'm a big fan of the pizzas especially! There are a few changes and updates to the NYC trip information. 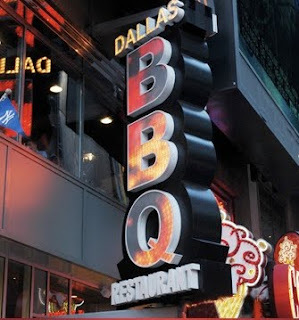 *We are now eating at Dallas BBQ in Times Square on Saturday night. Sardi's was going to charge us an EXORBITANT amount for our evening meal (nearly $100 per person) so we opted for a change of venue to Dallas, which features chicken, ribs, and steak. It is directly in the heart of the theater district on 42nd street.